Welcome, dear guests / pilgrims! 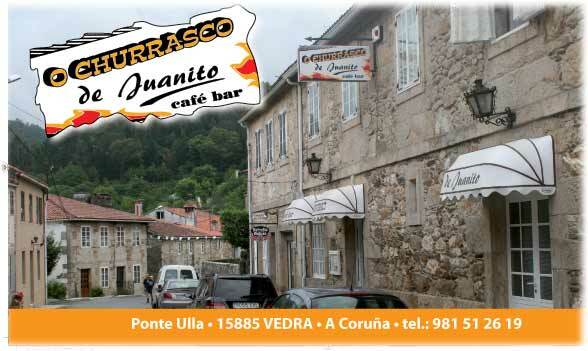 We takes pleasure to inform you of that Juanito's Steak (meat for the ember) opens the whole week except on Tuesday to offer you our speciality: the meat to the gridiron (in Galician: churrasco). It is elaborated by meat of the first quality. Also we offer them previous notice paella and cod to the oven. We invite you to visit us if you realize the St. James Way or if you take a walk for Ponte Ulla, our locality. Our cilentes are our friends too. The books for meal and dinners, as well as the rooms service is taken by telephone for a couple of months. Galician, Spanish and Portuguese are spoken. Thank you very much and have a good trip!